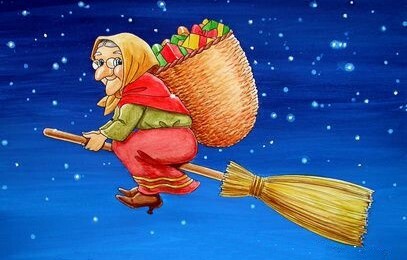 In Italian folklore, Befana is an old woman who delivers gifts to children throughout Italy on Epiphany Eve (the night of January 5) in a similar way to St Nicholas or Santa Claus. A popular belief is that her name derives from the Feast of Epiphany or in Italian La Festa dell’Epifania. Epiphania (Epiphany in English) is a Latin word with Greek origins. “Epiphany” means either the “Feast of the Epiphany” (January 6) or “manifestation (of the divinity).” Some suggest that Befana is descended from the Sabine/Roman goddess named Strina. In popular folklore Befana visits all the children of Italy on the eve of the Feast of the Epiphany to fill their shoes with candy and presents if they are good. Or a lump of coal or dark candy if they are bad. In many poorer parts of Italy and in particular rural Sicily, a stick in a stocking was placed instead of coal. Being a good housekeeper, many say she will sweep the floor before she leaves. To some the sweeping meant the sweeping away of the problems of the year. The child’s family typically leaves a small glass of wine and a plate with a few morsels of food, often regional or local, for the Befana.